Qatar is one of the 23 countries in the world where Microsoft Surface 2.0 is available for pre-order as of November 17, 2011. The product is available through Samsung resellers via the Samsung Electronics website. The Samsung SUR40 with PixelSense technology makes it possible for people to share, collaborate and explore together using a large, thin display. 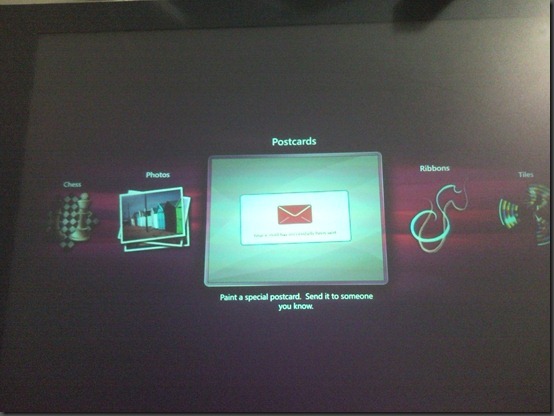 Recognizing up to 50 points of simultaneous touch, including fingers, hands and other objects placed on the screen, it has been well-received by new and existing Surface customers as companies such as Dassault Aviation, Fujifilm Corp. and Royal Bank of Canada prepare to deploy units around the globe in early 2012. Announced earlier this week, the next-generation device was named a 2011 “Best of What’s New” award winner by Popular Science magazine. Partners and Software developers interested in creating solutions for the Samsung SUR40 can visit the Surface Developer Center to get started with the Surface 2.0 software developer kit, featuring the Input Simulator, which enables developers to write Surface applications on any Windows 7 machine, as well as other helpful developer-related resources. There are already hundreds of highly skilled Surface software development partners that can be found at http://www.surface.com. The 23 countries where Samsung SUR40 is available for pre-order are Australia, Austria, Belgium, Canada, Denmark, France, Germany, Hong Kong, India, Ireland, Italy, Korea, the Netherlands, Norway, Qatar, Saudi Arabia, Singapore, Spain, Sweden, Switzerland, the United Arab Emirates, the United Kingdom and the United States. On Wednesday at CES, Microsoft & Samsung announced the new Surface 2.0, which is now thinner and smarter than ever before. With the new PixelSense technology, Microsoft Surface now sees and responds to touch and real-world objects. With the new 40” Samsung SUR40 technology, Microsoft Surface can now be used as a table or mounted on a wall! The Surface is no longer the cube-shaped box with cameras inside – now it’s just 4 inches thick. The cube shaped form factor has been replaced with tough Gorilla Glass screen and infrared sensors, which give better response and accuracy. Instead of having cameras underneath the glass, the new PixelSense technology makes “each pixel a camera”, so “each pixel sees”. What’s more, the surface is now much lighter, now that the “box” underneath has vanished. Surface is now embedded with Windows 7 Professional 64 bit. The SUR40 can be purchased from Samsung. Microsoft is no longer selling Surface 1.0 hardware. Partners – this is a great time to consider investing with Surface to build creative solutions for your customers using this futuristic platform. Last evening, my colleague Mamoun and I were invited to a get-together of Doha’s Hotel IT Managers at the Intercontinental Hotel, Doha. We had some great conversations around Microsoft solutions for the hospitality industry and I had a chance to discuss Microsoft Surface, Unified Communications and Windows 7 adoption issues. What was more captivating was the community that the IT Managers have formed as a platform to foster the informal exchange of information and ideas and to collectively discuss technology and challenges. I would like to thank Mr. Hussein Yaghmour, IT Manager of the Intercontinental Doha, for hosting this get-together, for inviting us to be a part of this great community event, and for the fantastic dinner! During my recent trip to Dubai, I came across Microsoft Surface units in the Emirates Lounge at Dubai Airport Terminal 3. 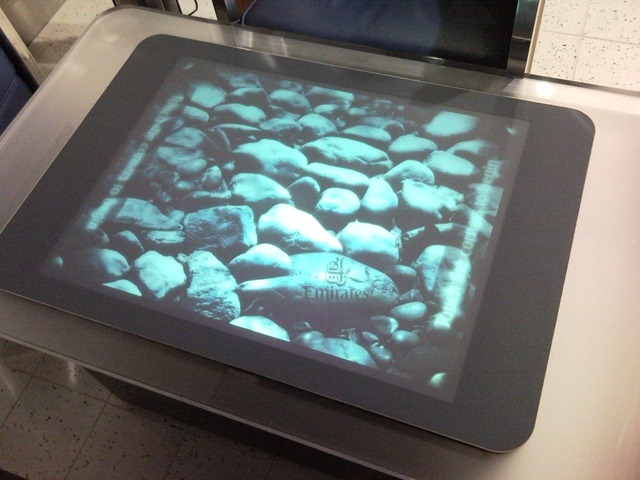 The Microsoft Surface units had a variety of applications, games and media on it for passenger entertainment. I found an intuitive application that lets one customize and send a postcard via email. Here’s a video of that application that I took on my cellphone camera. The Emirates lounge also had many xbox units with some exciting games, including Forza Motorsport. The whole lounge is pretty hi-tech, except for the internet kiosks, which still ran Windows XP with Internet Explorer 6 in a lockdown mode, that allows only one browser instance to be opened with no tabs! Several months ago when I first wrote about Microsoft Surface, many readers told me how impressed they were with the surface computing technology that makes it so natural for users to interact with it. But many readers also expressed concerns on what would be the potential use of such an exciting piece of technology to the average business user. So here I bring you some of the newer advancements in this area of research – each of these videos show a different application running on the surface – from documenting heart surgeries, to managing credit card finances! Yes, a server for your home! Microsoft has come up with Windows Home Server, which is a server operating system for the home. If you have multiple PC’s at home, this is an excellent way of organizing and sharing digitial stuff like photos, audio and video. The Microsoft-powered home thing is getting real. I remember Bill Gates’ vision – “A computer in every home“. What next? A server in every home?! First it was with Windows Vista, and now it is with something totally new and simply astounding. Unimaginable. Microsoft’s doing it again. They keep coming up with exhilarating technology that just makes us go – wow! Imagine this: You walk in to your home and have an interactive table in front of you. You can draw things on it with your hands, do stuff that you do on a computer – without a mouse or a keyboard!! 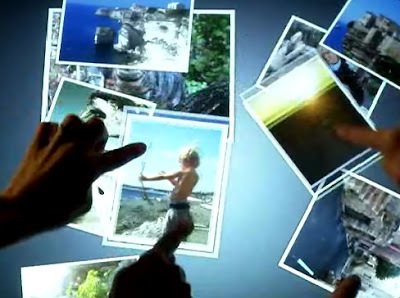 You shuffle through photos on the table-top with your fingers – just as though they were real photos scattered all over the table! You hold the edges of the photos with your fingers and pull them and they resize! You place your phone or your Zune on the Surface and not only does it sync automatically – you can also ‘pull out’ files using your fingers and put them on the Surface near the device, so that the device will pick it up and save it – right off the Surface! The Surface is amazing. The Surface is real. You find your music albums scattered on the Surface and you flip through them with your fingers and select your choice of music. 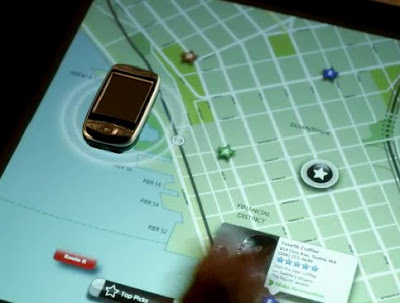 You can place your phone on the surface and roll out your city map and select the place you wanna go and your GPS enabled device takes you there! You write email with your fingers — minus the keyboard. The future is Surface Computing. The future is here. I’m still recovering from what I saw.